What is not being said aloud in meetings matters. For individuals with severe hearing loss, often more adept at catching nonverbal communication than their peers, picking up on these nuances of body language and facial expressions are the key to understanding the message. This form of non-linguistic communication is central to Nonverbal Communication. According to research, up to 55% of what we communicate is in our body language, combined with other visual cues such as small changes in facial expressions, the tone of voice in how a person is saying something, touch, and even a person’s appearance, and physical proximity. Nonverbal communication is at the core of understanding one another and can even enable those of us with hearing loss to even interpret what the other person is feeling and thinking. With nearly 60% of the U.S. workforce facing some degree of hearing loss, and as the nature of future work environments and collaboration changes with greater remote and virtual workplaces, nonverbal communication will be essential to understanding what is not being said in meetings, webinars, trainings, and conferences. Here are three tips from Laurie Achin, American Sign Language faculty member at Northeastern University along with Katie Fitzpatrick and Miriam Horowitz, both sign language interpreters, to catch the nonverbal cues people may be missing. Katie Fitzpatrick, a NIC Advanced certified SLS Instructor at Madonna University, explains that Deaf people are usually more skilled in the linguistic concept of “backchannel” than hearing people. Backchannels, such as the words “uh-huh” and “hmm” in the English language, demonstrate understanding of what is being communicated. Since those who utilize sign language often take notice of everything including a person’s movements to derive meaning, backchannels serve as a critical component in communicating. According to Laurie Achin, changes in body movements such as pushing forward, sitting up higher, and becoming restless while sitting may be a sign that a participant in a meeting is attempting to speak up or interrupt the current person speaking. This, however, can be challenging to spot in a group video conference wherein it’s difficult to observe other participants’ body movements and gestures. In these situations, Fitzpatrick proposes the establishment of group communication norms prior to the start of meetings. One possible group communication norm could be the requirement that the speaker pause for questions and feedback on each agenda item. It is also important for each meeting participant to adhere to these norms. Another idea might be the utilization of a chat function so that ideas can be shared by all participants without stopping to interrupt the current speaker. Miriam Horowitz, a NIC certified SLS Instructor at Madonna University, believes that Deaf people are conscious of what is being perceived in their peripheral vision. “Sometimes they’re not looking at you, but can catch everything that I am interpreting or signing to them. They have such strong peripheral vision, they catch the smaller, more subtle nuances, better than hearing people who rely on the audible cues that we give one another,” Horowitz says. Those who are leading a meeting should be fully aware of their peripheral vision, and be observant of participants in the room who may have interjections and additions. 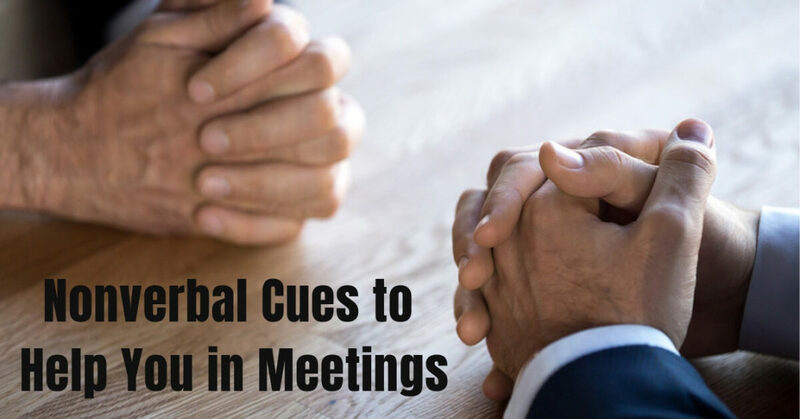 It is not usually advisable to make interruptions during business meetings, but according to Horowitz, the culture is now more open to interjections with the increasing awareness of communication access needs for Deaf and hard of hearing communities. Consequently, Horowitz notes that, “more forceful” turn-taking in the Deaf community, such as shoulder tapping and other attention attracting methods, is now more common. She also notes that there is a greater collaborative effort in sharing the speaking floor among the deaf and hard of hearing community. If one participant notices another trying to make an interjection or attract the speaker’s attention, that person will usually guide the speaker in that direction by pointing. With collaborative situations such as this, is essential to have greater communication access in the deaf and hard of hearing community. The lesson learned from these collaborative efforts is to ensure all participants are heard, especially if you are the person facilitating the meeting. It is also important to note that according to research, women are often times interrupted more times than their male counterparts. In sharing information at a future meeting, consider paying more attention to visual cues which can lead to greater insights. Don’t let hearing loss hold you back – both in the workplace and in everyday life! If you believe you are experiencing changes in your hearing, contact us at Comprehensive Ear and Hearing to schedule a hearing test and learn more about hearing solutions.